part of her Thanksgiving Vignette blog hop. the blog hop at the end of the post. home to remind me to also give thanks. or sayings that have meaning to you. that they might have come over on the boats with the Pilgrims. I aged some lightweight card stock with coffee grounds. I ran them through the printer one at a time on the aged paper. paper they were printed on. attached to the chicken wire with tiny wooden clothespins. Cottage At The Crossroads blog make a couple of years ago. sayings/verses on the chicken wire display. Lobby. The middle of the candlesticks were a glassy pink. They got a neutral color distressed and crackled paint job. have enough stiffness to lean up against an object. They are all wonderful posts...you don't want to miss them! Thanks for coming by to see my Thanksgiving Thoughts! These are really neat, Gail! I love the chicken wire frame too. What a wonderful way to decorate for Thanksgiving Miss Kitty. I love the plaster leaves, they are just darling. What a pretty softer side of autumn display. Thank you so much for sharing the idea of the Thanksgiving thoughts. I love them on the dinner table...just perfect! I just love what you have done!! I think I might move my thankful tree to something more like this next year. It's perfect! Gayle I LOVE how that turned out... what a fabulous idea! Love the pretty vignette on your buffet too! Have a great weekend! Those are very pretty. I bet your guests will love reading them. What a great Thanksgiving display! I love those white leaves! Love the whole thing...it's brilliant! Gayle, I absolutely the wire frames and your Thanksgiving thoughts. Thank you so much for sharing your pretty vignette at the blog hop! Oops, I meant I absolutely "love" the wire frames and your Thanksgiving thoughts. you have captured the true meaning of our Thanksgiving. I love it all. Your board really makes a statement of Thanksgiving. I love that you used Bible versus. I would do the same,I have several versus that I rely on daily. 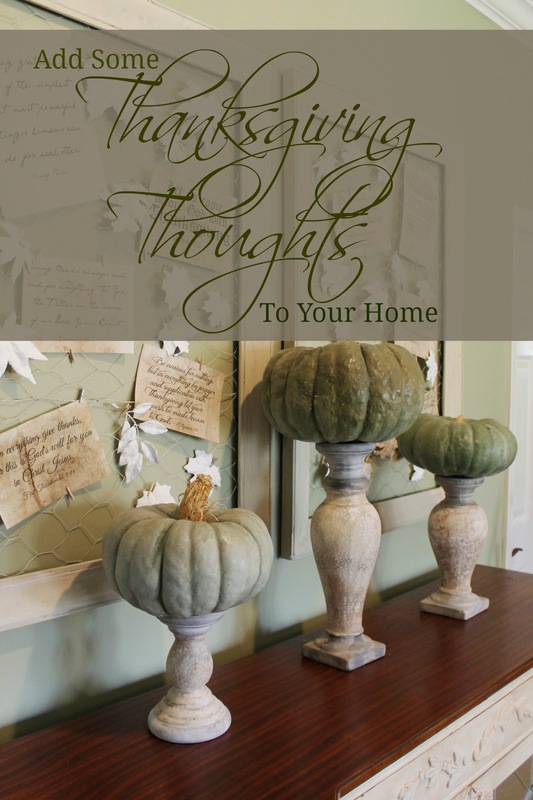 Those "thoughts" are such a great idea...love them on the frames and tucked within a vignette...beautiful vignettes Gayle. Love this idea, written thanks at Thanksgiving! The chicken wire frames look great and the leaves are the perfect finishing touch. Will have to check out how you made them!